The centre of gravity has shifted from the Northern United States and Canada toward the growing population of the Southern United States and the emergence of Mexico as a sales market and export base. Automakers set a North American production record last year as 17.9 million light vehicles poured off assembly lines in the U.S., Mexico and Canada. It was the third consecutive year production topped 17 million vehicles, the first such streak in history. Unsurprisingly, the production surges roughly match the top five auto sales years in the United States. But the nature of North American auto production has changed profoundly over the last decade. Compared with 2007, the production base is less dominated by Detroit. The centre of gravity has shifted from the Northern United States and Canada toward the growing population of the Southern United States and the emergence of Mexico as a sales market and export base. Assembly plants are more flexible, efficient and truck-oriented. Manufacturers are building more vehicles in fewer plants. Production has constantly grown and evolved on this side of the Atlantic since Henry Ford applied the assembly line process to automobiles on Piquette Avenue in Detroit. Domestic automakers built a production model that essentially radiated from the Motor City. That went virtually unchallenged until Volkswagen, Honda and Toyota established production footholds in North America in the 1970s and ’80s. Asian and European automakers had developed strong North American presences by the turn of the century, but the crucible of the Great Recession accelerated the decline of the Detroit-concentric production model. After the Lehman Brothers failure in September 2008 triggered the auto sales collapse, the bankruptcies of General Motors and Chrysler and a 2009 North American production plunge to 8.6 million vehicles, the Detroit Three closed their least-efficient plants to survive. Compared with 2007, GM, Ford Motor and what became Fiat Chrysler Automobiles operate 17 fewer North American assembly plants. What’s different about North American auto production from a decade ago? It’s more diverse. Detroit automakers still control a bare majority, with GM, Ford and FCA holding 50.5 per cent of output in the United States, Mexico and Canada in the first eight months of 2017. But in 2007, their share was 63.2 per cent, a swing of 12.7 points. Who ate Detroit’s lunch? Everybody. In 2007, Hyundai built 250,519 Sonatas and Santa Fes in one plant, a 1.7 per cent share. So far this year, Hyundai-Kia has a 5.4 per cent share, with 632,111 vehicles from three plants in Mexico and the U.S. Europeans had 4.9 per cent of North American production in 2007 and 7.7 per cent this year. Japanese manufacturers have 36 per cent of production this year, up from 30.1 per cent in 2007. As manufacturers respond to the swing in demand for crossovers, SUVs and other sit-high vehicles in the United States and other markets, including Canada, car output is dwindling rapidly. In 2007, cars made up 44.1 per cent of North American production. So far this year, that’s down to 35.3 per cent. It’s shifted south. Mexico production is booming, and the manufacturing footprint is shifting from plants just across the U.S. border to plants in the middle of the country, nearer Mexico’s population centres and handy to ports on the Pacific and Gulf of Mexico. Thanks in part to the Mexican government crafting trade deals with dozens of other countries, Mexico has become an export centre. And the Mexican domestic market is growing. The U.S. share of output has declined to 65.4 per cent this year from 69.9 per cent in 2007 and shifted farther south as Asian and European brands have developed a hub in Southern states. But Canada has lost almost a quarter of its North American production share, from 16.8 per cent in 2007 to 12.9 per cent this year. It’s more efficient. Fewer plants are producing more vehicles. 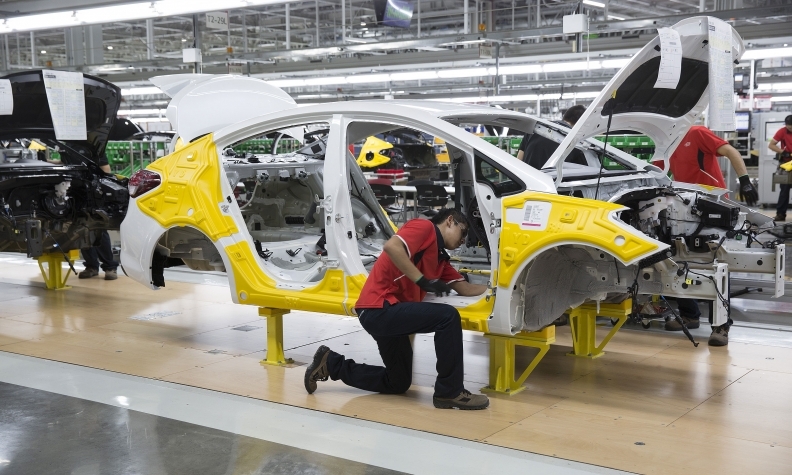 In 2007, 85 assembly plants, including nine with two production lines, built 15.2 million light vehicles. In 2016, the most recent complete year, 75 plants, including 13 with double lines, built 17.9 million units. The output per production line: 161,000 in 2007; 204,000 in 2016. It supports fewer brands. Automakers aren’t supporting as many brands with North American manufacturing. The greater efficiency is most apparent at GM, which shed Saturn, Pontiac, Saab and Hummer after its bankruptcy. But North American production also has stopped since 2007 for other brands: Isuzu, Suzuki, Mitsubishi, Mercury and Opel. What’s been added since 2007? Tesla and Kia.